Removal ProcedureRemove the transmission control valve body cover. Refer toControl Valve Body Cover Replacement. Disconnect the input speed sensor electrical connector-(1).Disconnect the output speed sensor electrical connector-(2).Disconnect the shift position switch electrical connector-(3). 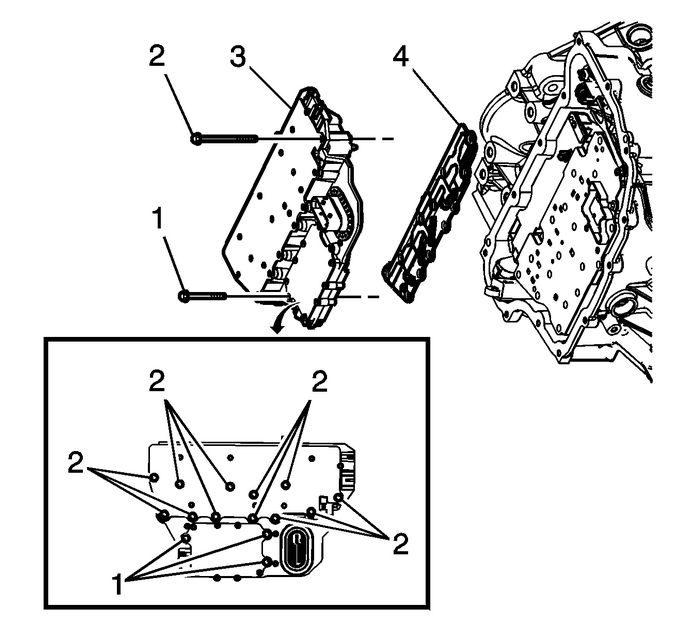 Remove the 3-control solenoid valve assembly bolts-(1) M5 x 40.5.Remove the 12-control solenoid valve assembly bolts-(2) M6 x 97.Remove the control solenoid valve assembly with transmission control module-(3). Caution:Use care when removing or installing the filter plateassembly. 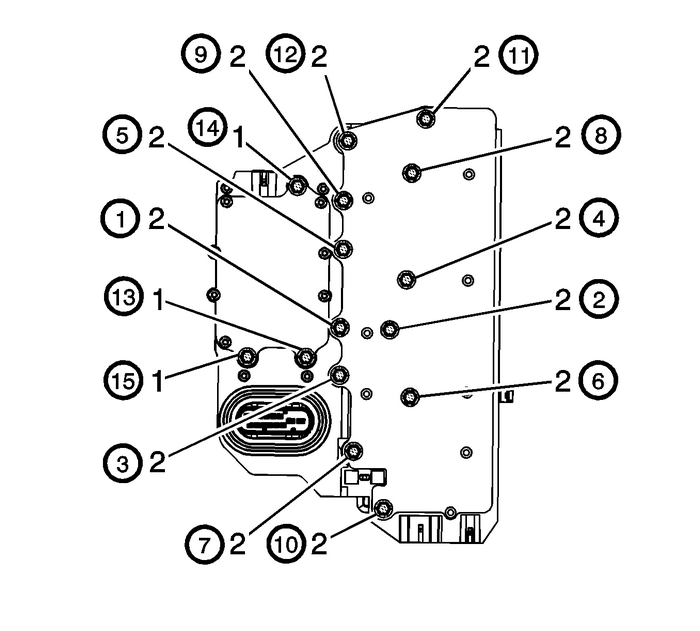 A broken or missing retaining tab may not adequatelysecure the filter plate to the control solenoid valve assembly,resulting in possible damage or contamination. Install a NEW control solenoid valve assembly filter plate-(4) to prevent fluid leakspast the fluid seals.Install the control solenoid valve assembly with transmission control module-(3).Hand start the control valve body bolts-(1,-2). Secure the 12-control solenoid valve assembly bolts-(2) M6 x 97 and tighten in sequenceto 10-Y (89-lb-in).Secure the 3-control solenoid valve assembly bolts-(1) M5 x 40.5 and tighten in sequenceto 7-Y (62-lb-in). Connect the input speed sensor electrical connector-(1).Connect the output speed sensor electrical connector-(2).Connect the shift position switch electrical connector-(3).Install the transmission control valve body cover. 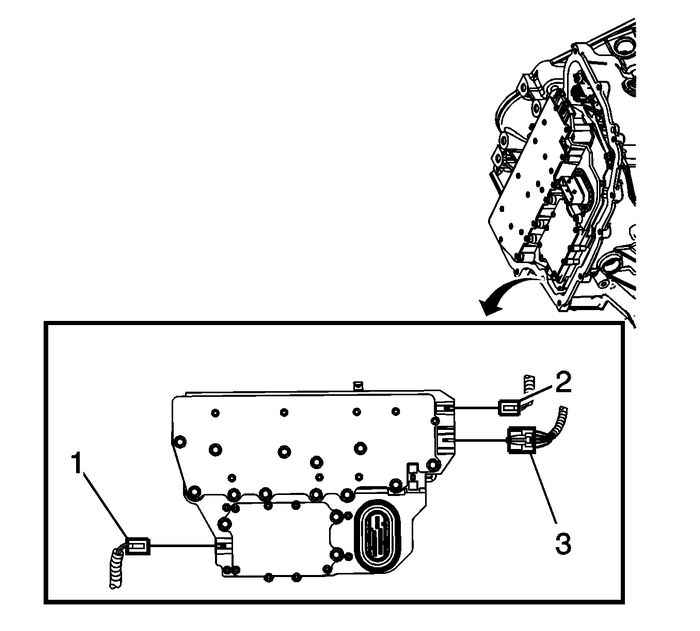 Refer toControl Valve Body Cover Replacement.If a NEW TCM has been installed into the vehicle, the NEW module needs to be reprogrammed.Refer toService Programming System (SPS). Transmission internal service/overhaulValve body repair or replacementControl solenoid valve assembly replacementTCM software/calibration updateAny service in response to a shift quality concernPerform the Transmission Adaptive Values Learn procedure. Refer toTransmission Adaptive Values Learn.